Ticket Giveaway! Attend The Wedding Salon Bridal Show at SLS Hotel at Beverly Hills! For all of our wonderful Los Angeles area brides-to-be, we’re excited to say that today The Wedding Salon Bridal Show is gifting 10 lucky couples a luxurious evening of wedding planning, cocktails, beauty and couture at their March 19th event at celebrity hotspot, SLS Hotel at Beverly Hills! From 4-8pm, you can meet with the top names in weddings to help you plan your big day! Enjoy Cake Tastings by Tori Spellings favorite, Hansens Cakes, Beauty Makeovers by Youngblood Cosmetics (with a special guest appearance by a True Blood star), the Nordstrom Wedding Suite featuring Amsale Gowns, Couture Gowns by Winnie Couture, Wine Tastings by Francis Ford Coppola Winery, and Pinkberry treats. Win Honeymoon Getaways, Score a VIP Gift bag with goodies by Frederic Fekkai, Essie and more! To enter to win 2 tickets (a $50 Value), simply email [email protected] by the end of the day on Sunday, March 11, 2012 and include your wedding date and e-mail address. The Wedding Salon will randomly draw their 10 lucky winners and e-mail them each directly on Monday, March 12, 2012. Good luck readers! We wish we could attend this fantastic event with you! The Wedding Salon events can inspire you to find the best resources for your wedding. Countless luxury wedding vendors will be available to help you plan your big day.Their unique events are produced like million dollar weddings and attract the highest caliber talent in the industry. You can discover the latest trends in Photography, Invitations, Honeymoons, Couture Gowns, Flowers and Cakes, and enjoy Beauty Makeovers, Cocktails, Gift Bags, Fantasy Table Décor and so much more at this special one day event. Discover who will be at the event beforehand by visiting the companys website, create a targeted list of who youd like to meet. Arrive early to scout your desired vendors. Bring your camera to capture your favorite gowns, fantasy reception tables and inspiration for your big day. Have fun!!! Bring a girlfriend and be sure to enjoy every minute of planning. This post has been Sponsored by The Wedding Salon. Free Tickets to The Wedding Salon Event in Chicago on October 9th! 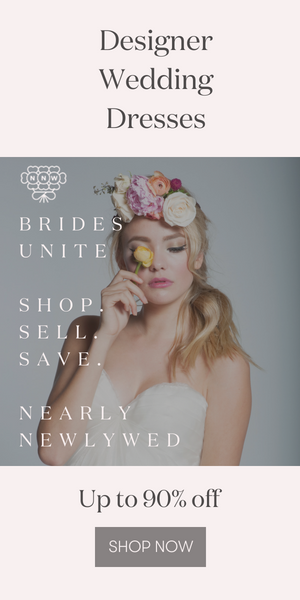 Don’t Miss The Wedding Salon in NYC on November 5th – Free Tickets for Junebug Readers!